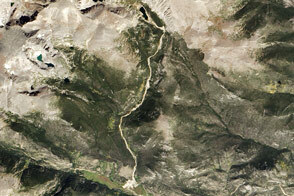 Rocky Mountain National Park is located in northwestern Colorado. The Never Summer Mountains form the western edge of the park, on the left in this image, with the Colorado River flowing south from its headwaters in the park through Shadow Mountain Lake (larger lake on the left bottom corner) and Grand Lake (smaller lake to the immediate right of Shadow Mountain Lake). The range of the Continental Divide, which separates the drainage basins that flow into the Pacific from those that flow into the Gulf of Mexico, runs diagonally through the center of the image. The two bright green patches on the right side of the image mark golf courses just outside the park entrance at the Estes Park Headquarters. Much of the park was shaped by glaciers, the remainder of which have retreated to the high passes in the mountains. The mountains in the park are substantial, standing taller than 11,000 feet and maintaining snow pack through the entire year. In winter, cold air flows into the bottom of the valleys, which favors smaller trees and bushes, while the slopes below the snow line are typically covered with taller spruce and fir trees, among other species. In this image, the difference is apparent in the lighter green shades in the valley floors compared to the slopes above them. 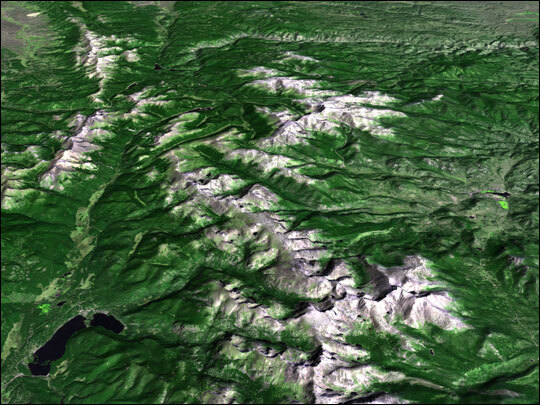 This image was acquired by Landsat 7’s Enhanced Thematic Mapper plus (ETM+) sensor on October 5, 1999. This is a natural color image, but has been enhanced by adding near infrared to the green channel, which emphasizes vegetation. (ETM+ bands 3, 2, & 1, with band 4 averaged with 2). This scene has also been pan sharpened. Terrain data were derived from the Shuttle Radar Topography Mission (SRTM) aboard the Space Shuttle Endeavour, launched February 11, 2000. SRTM used the same radar instrument that comprised the Spaceborne Imaging Radar-C/X-Band Synthetic Aperature Radar (CIR-C/X-SAR) that flew twice on the Space Shuttle Endeavour in 1994. SRTM was designed to collect three-dimensional measurements of the Earth’s surface. To collect the 3-D data, engineers added a 60-meter-long (200-foot) mast, installed additional C-band and X-band antennae, and improved tracking and navigation devices. The mission was a cooperative project between the National Aeronautics and Space Administration (NASA), the National Imagery and Mapping Agency (NIMA) of the U.S. Department of Defense (DoD), and the German and Italian space agencies. It is managed by NASA’s Jet Propulsion Laboratory, Pasadena, California, for NASA’s Earth Science Enterprise, Washington, D.C.
SRTM elevation data were merged with the Landsat 7 data and processed to show the terrain at its natural scale (no vertical exaggeration) in a tilted perspective. In this image, north is up and west to the left. 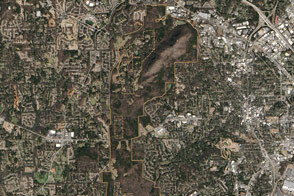 Landsat image provided by the Goddard Space Flight Center’s Landsat Team.